​Hospitals belong where people live. Residents of Windsor, Ontario are left with no choice but to take their healthcare into their own hands by launching a legal campaign to keep hospital services within the region's most densely populated neighbourhoods. ​Both Windsor Regional Hospital (WRH) campuses (Met & Ouellette) are to be replaced by a single regional mega-hospital located on active farmland 13 km (8 miles) from the city centre. This will make hospital-based services much less accessible for tens of thousands of Windsor’s 200,000 residents. Local officials have used mixed messages and strategically limited public input and discussion about the greenfield mega-plan. This has misled many residents into believing they are gaining an additional hospital rather than losing two. Join our fight to give our residents a voice in this process. We fully believe in the need for updated local healthcare infrastructures. However, a decision this monumental, which will affect our healthcare for generations to come, should result from a process that is completely transparent and inclusive. The only way we can achieve this result is by winning our legal appeal. However, this is a complex and costly legal challenge. We need your support. When you donate, no matter how large or small, you are raising your hand (publicly or anonymously) that you believe that hospitals belong where people live. The proposed WRH mega-hospital is part of a larger development scheme: the Sandwich South Secondary Plan. The mega-hospital is to be built on what is currently active farmland adjacent to Windsor's airport. The 60-acre facility is being used to justify the residential and commercial development of a further 1,000 acres of prime agricultural land. Yet, when you look at current statistics, the need for a new subdivision outside of the city core is not supported: the local population is aging and economic growth is stagnant. Other communities are tackling their healthcare infrastructure modernization by taking advantage of existing urban infrastructure. 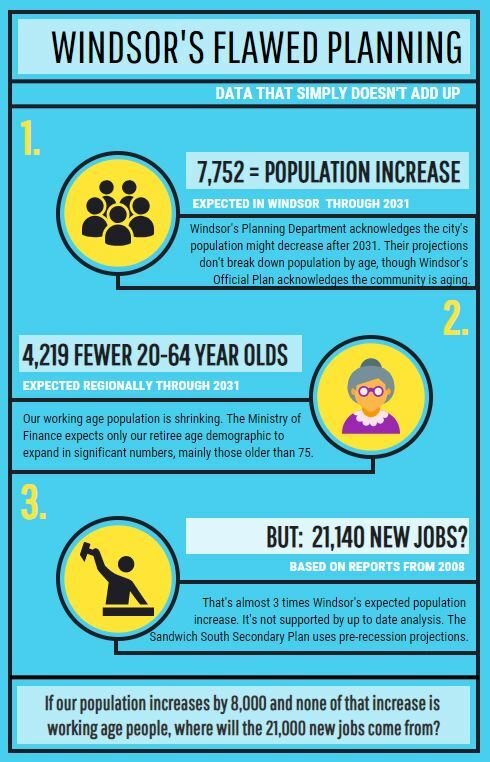 While the mega-plan may temporarily benefit a few developers, it will increase Windsor’s long-term residential tax burden and create barriers to healthcare for many of the city's most vulnerable people. Developing Sandwich South also disregards Windsor's Official Plan and Ontario's Provincial Policy Statement. It creates further urban sprawl at a time when other municipalities are shifting to implement more environmentally responsible planning policies. For five years, fact-based concerns raised by Citizens For An Accountable Mega-Hospital Planning Process, along with community groups that include the Ontario Health Coalition, and a growing number of individuals willing to speak out publicly, have been ignored. Together, we have been pleading with local decision-makers to develop a legitimately responsible, inclusive and transparent planning process. This destructive scheme will affect the region’s health, economic and environmental well-being for generations to come. While hospital officials encourage staff to express their support, the public is largely unaware that medical personnel are prevented from voicing negative concerns. There’s no debate about the need for updated local health care infrastructures. Residents in outlying municipalities also need and deserve accessible healthcare, though the solution does not lie in pitting county residents against city residents. There are better ways to improve Essex County residents' access to healthcare services that do not involve gutting the city core. ​In October, 2018 we filed a legal challenge against Windsor City Council`s August 13, 2018 decision to greenllight the proposed mega-facility. A note to health care professionals and other supporters who may need to remain anonymous: We thank those of you who have supported our efforts but could not publicly come forward. We want to assure those who will financially contribute to this important campaign, that all anonymous contributions will remain completely confidential. ​For media enquiries, please contact Philippa von Ziegenweidt via our contact page. Thousands of residents have declared their displeasure with the anticipated closing of Windsor's urban hospitals with lawn signs: "Don't Close Met and Ouellette, We All Deserve Better! ", "Re-think the Mega-Plan, It's not a Done Deal" and "Re-think the Mega-Hospital, We Deserve a Better Plan!"